SeaQuest is the sister company of Oasis Resort, where I stay. It's got its own boat which is the biggest in all of Panglao. It's long and wide, I could practically hold a yoga class there. "Big", "spacious" and "luxurious" seem to be trademark of these companies. It was also clean, organized and well-maintained. 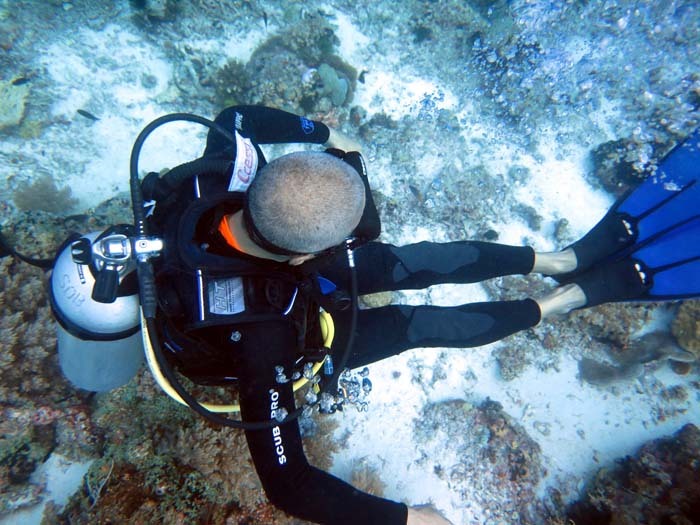 SeaQuest also offer PADI dive courses and yes, Freedive courses! They were the first few ones to establish a dive shop in Alona 27 years ago when there was nothing yet on the island! Their long experience is evident in the professionalism to everything they do. 2 thumbs up to SeaQuest and Oasis! 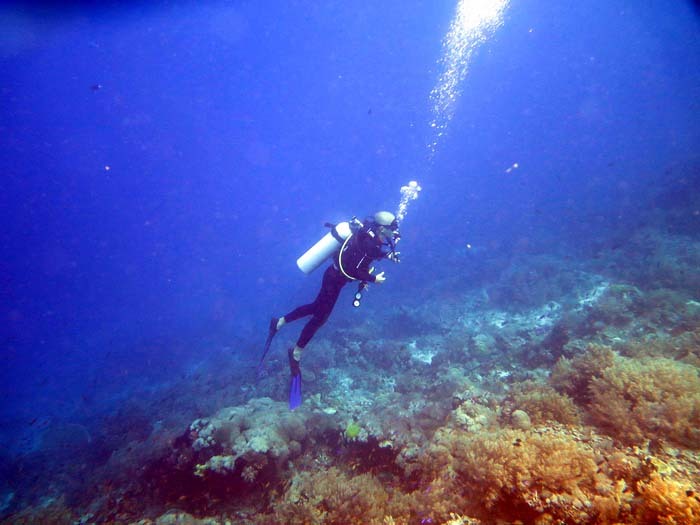 Since my Dumaguete days in 2008, I was already hearing about the great dives in Balicasag Island - the pencil-shaped coral reef sticking out from the ocean floor at over 100m deep (in some areas) and onto the island top. I even heard about a marine biologist back in the 70s who was towed by a slow pumpboat around the island with his mask/snorkel. 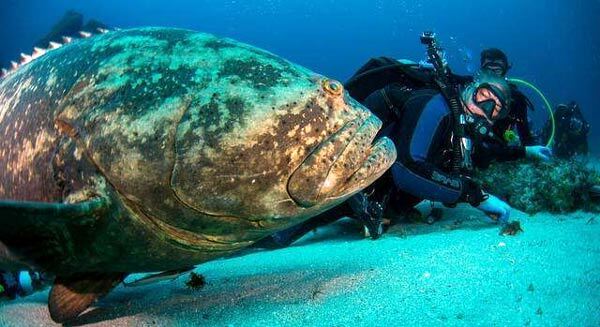 He said it was raining fish, and that every 50m, he would see a Volkswagen - a moniker for a giant Grouper as big as a Volkswagen Beetle. Just a few years ago, I actually met this guy - and the story is true! We're talking nearly 50 years ago. Now, of course, as excited as I am to finally make this dive, I had to manage my expectation. Cathedral Dive is a vertical wall that plunges down 60m. I couldn't see the bottom as we hovered on the 18m depth. The feel and visual spectacle was something similar to the Catherdral Dive of Apo Island - both are simply wonderful. Plant life and marine life are thriving with all their vivid colors. From the small ones like the nudibranch to the big groupers, and every size in between, you see them all. Black Forest was a lot of fun with its strong current. It was a drift dive where you still have to do a lot of steering to coast along the drop-off area. Although the drop-off descends down to a dark-blue abyss, we only hovered where the drop-off began, roughly 15m. The coral reef was intense and colorful...very healthy and animated. There were thousands of little fishes of different species just clustered along the reef system - you had to wade through them! 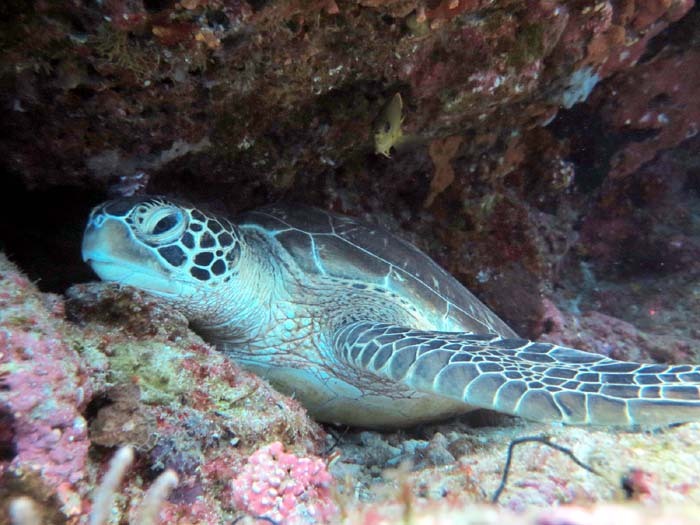 The big stuff I saw were a Green Turtle, Titan Triggerfish and Marbled Grouper. The Titans were not hostile this time around. This dive is a winner! Finally, I could check-off Balicasag off my "must-do" list. And yes, it lived up to its reputation! My wish for this island? Do whatever it takes to ensure the re-emergence of the Volkswagen! Just think what that will do for tourism! Big thanks to my dive master, Jerson, the boat crew and to SeaQuest for the memorable experience!